The nation yesterday commemorated the 40th anniversary of the first human landing on the Moon. I have early childhood memories of watching on TV the lunar rover during a subsequent Apollo mission. Before thumping ourselves on the back too hard, we should remember that the space race was a technological battle with the Soviet Union in which the U.S. got whipped early on and often. And there were an incredible number of failed missions (primarily unmanned vehicles) along the way. It's a story whose history shows us just how difficult it is to develop new technologies. First to achieve hyperbolic velocity. "We have defined the space race in a way that makes us at the top," said Dr. Tyson. "There is a delusion to remember ourselves as somehow pioneers above all else." Image of Luna-2, the first space vehicle to (crash) land on the Moon -- nearly 50 years ago on September 13, 1959. The Ward 21 Democratic Committee has decided not to endorse a candidate for the preliminary municipal election of District 9 City Councilor for Allston-Brighton. The four candidates for the seat -- incumbent Councilor Mark Ciommo, plus challengers Abigail Furey, Benjamin Narodick, and Alex Selvig -- appeared individually in front of the committee last week to speak and answer questions. The committee then voted, with no candidate receiving the 2/3 majority required under its by-laws to obtain an endorsement. In the 2007 election for the open seat, the committee endorsed Tim Schofield for the preliminary municipal election. When he failed to make the final by placing third, the committee then endorsed Mark Ciommo for the municipal election -- which was not surprising because the other candidate, Gregory Glennon, failed to appear in front of the committee. This non-endorsement appears to be a black eye on the re-election bid of Councilor Ciommo, particularly since they have endorsed him previously. Selvig seemed to relish spreading the news on his Facebook page, as did Narodnick via Twitter. Furey? Not so much. The Ward 21 Democratic Committee has undergone some recent leadership changes in its leadership. Darrin Wilson is the new chair, Eric Fox the secretary, and Nan Davis Evans has switched to the affirmative action/outreach position. 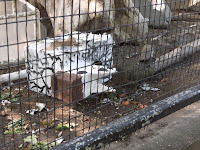 How To Combine Zoos to Create "Efficiencies"
Combining zoos in order to save money -- create "efficiencies," in bureaucrat-speak -- could be accomplished in a number of novel ways by moving the Stone Zoo animals to existing exhibit space at the Franklin Park Zoo. The key is that new exhibit space cannot be built, otherwise such expensive new construction would not save money. Mexican Gray Wolves. These animals are one of the most popular attractions among the children at Stone Zoo, particularly due to the challenge to find them hiding up top a rocky promontory. Kids go crazy over the challenge of finding them, even if all they can glimpse are a few ears over the tops of some rocks. At Franklin Park, the wolves could easily be incorporated into the Children's Petting Zoo in a pen alongside the sheep and goats. Just lock the barn doors at night, and let nature do its course. Cost savings: much reduced expenses for feeding not just the sheep and goats, but also the wolves. Bonus: occasionally take a few chickens next door and toss them into the barn before closing it for the night. More savings. Coyotes. Ditto. Easy answer, similarly good cost savings. Added benefit: watch the wolves and coyotes duke it out, and charge admission to raise even more money. Bald Eagles. The bald eagles at Stone Zoo could be put to good use in the Tropical Forest Pavilion, even though the climate inside (warm and humid) isn't quite to their liking. Just alternate them between the mandrill and lemur exhibits, both places where the eagles would have a field day catching hordes of mice. Kill two birds with one stone. Flamingos. There are flamingo exhibits at both zoos, so a bureaucrat could easily look at a piece of paper and determine that putting them all into a single enclosure at Franklin Park would save money. Never mind that the Franklin Park enclosure looks horribly crowded already -- or that it was an (originally) temporary location for them when they were evicted from the bottom of the aviary next door, which itself had to be evacuated of birds a couple of years ago to make way for an installation of a dinosaur exhibit featuring fake animals. No worry. Just cram all those flamingos into that little enclosure and watch the mayhem that ensues. It'll look like Fantasia 2000, I'm sure! River Otters. These frisky animals have a recently-renovated exhibit at Stone Zoo. They require water for swimming around, so the obvious place for them is the aquarium tank in the Tropical Forest Pavilion. Saves feeding costs for both river otters and fish (see Wolves, above). Hornbills. There are a number of different birds at Stone Zoo that could be housed, at least in summertime, in the wide open space inside the Butterfly Pavilion netting. There's just a lot of extra, unused airspace waiting for animals to be crammed inside. Further efficiencies: some of the birds eat butterflies. Lion Exhibit. The male lion's exhibit at Franklin Park -- his female companion died a couple of years ago due to a blood illness -- is full of lots of empty space. 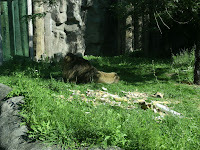 He spends pretty much the whole day in a little 10' x 10' area, sunning and sleeping and periodically roaring. Save money by fencing this 100 square foot space off so that the lion can keep it, but create new, fenced-in cages for other animals with the remaining space. In order to add interest, populate those adjacent cages with animals that will tempt the lion: reindeer, pygmy zebu, markhur goats, yak, zebras, wildebeest, etc. The lion will be clawing at through the fence all day, and the kids will eat it up! Jaguars, Cougars, Snow Leopard. These animals look sort-of similar to tigers, so you can just put them in with the yellow and white tigers in their recently-built exhibit. Or maybe just rotate the animals daily just to see if anybody notices. What's the difference? Meerkats. The Stone Zoo has some of these small animals from southern Africa, who like to hang out in tunnels and stand on their haunches above-ground. Franklin Park has prairie dogs from North America that share the same interests. Any old bureaucrat can see that they're bound to become BFF. Just throw 'em all together. Bonus: maybe they'll cross-breed and we'll get some new kind of mutant that can have its own series on Animal Planet. Licensing rights bring more money to the zoo, so it's gotta work. Birds-Of-Prey Show. Stone Zoo has a show during the summer where zookeepers fly birds-of-prey around the audience to display their prowess. Turn these animals into a traveling show that sets up shop at a different North Allston corner every hour. You know, North Allston has something of a rodent problem. Bonus: charge Harvard for the cost of the show, which they can then bill as a community benefit for their stalled Allston science complex. Win-win all-around. Bats. The bat exhibit in the "Sierra Madre" area of the Stone Zoo is located behind a darkened cloth entry, so that visitors can see the bats in their nighttime behavior. These animals are easy to find a home: I hear that the Governor's office has some nice new drapes that could provide the bats with their darkness. Goats. The U.S. Naval Academy always needs more goats, so ship 'em off to Annapolis. Snakes. Chairs of the committees at the state legislature would have first dibs in deciding where in the state house to release the snakes. Kangaroos. These animals have a large pouch on their front, which a perfect hiding place for stashing wads of cash in order to slip through security. House the kangaroos in the Dianne Wilkerson Memorial Office at the state house? Oh, and whose office would get the mountain gorillas? The stinky porcupines? The two condors? Image of a Poitou donkey, a new introduction into the Franklin Park Zoo's petting area, from Zoo New England's twitterPic. The lion at the Franklin Park Zoo was seen Friday morning mauling a giraffe while children were apparently cheering him on. His meal of fresh meat brought smiles to onlookers all around. The remnants of the giraffe can be seen at right. Later Friday, several Kea birds were also seen pecking away at a sheep laying on its side; one Kea seemed particular fond of gnawing at the sheep's ears. And to think: onlookers said that the zookeepers themselves moved the giraffe and sheep into the predators' cages. Yes, they did it deliberately. Amazingly, these feedings occurred on the same day that the zoo announced that, without additional funding, it would have to close in October and would likely have to euthanize at least 20 percent of its animals because they would not be able to find them homes. Despite appearances, the zookeepers are not, however, feeding some of the zoo's animals to each other as part of shutting the zoo down. The ravaging wildlife and the threatened zoo closure are completely unrelated developments. The giraffe and sheep were constructed from cardboard and papier mache by children attending Zoo Camp during the last two weeks. Zookeepers put fresh meat into the giraffe for the lion to eat, and vegetables (possibly also meat?) into the sheep for the Kea [left]. The fake animals are introduced into the cages as part of the wildlife's "enrichment" -- a process to provide interest and activity to animals who spend their life in captivity. Reports are that the Kea took a while to get interested in tearing apart the cardboard sheep, while the lion make short order tearing apart the cardboard giraffe. The educational opportunities of the zoo camp is one of the many ways in which the Franklin Park Zoo provides a valuable service to the community. Two Brighton residents, Patrick Galvin and Mark Alford, have jointly sued the City of Boston over its approval of Boston College's expansion plans into the former St. John's Seminary land purchased by BC in 2004-7 from the Archdiocese of Boston. The suit was filed in Superior Court Thursday afternoon. It names three defendants, all official governmental bodies of the City of Boston: the Boston Redevelopment Authority, whose Board approved BC's Institutional Master Plan in January 2009; the Zoning Commission, which approved the IMP in May 2009; and the BC Task Force, an official advisory body to the BRA Board (and appointed by Mayor Thomas Menino), who wrote a letter to the BRA Board generally supporting most of the elements in BC's IMP. Mayor Menino was not named as a defendant in the suit, which is a bit surprising (to this non-lawyer) given that he also had to approve BC's IMP. He objected to several details of the IMP as initially approved by the Zoning Commission; the ZC later approved modifications, and then Mayor Menino formally signed off in June 2009. The plaintiffs own property on Lake Street abutting the former St. John's Seminary land BC refers to as their "Brighton Campus." BC's approved IMP calls for construction on that land of athletics facilities (baseball stadium, softball stadium, support building, tennis courts), an auditorium, museum and new building for their fine arts department, and a parking garage. A related Article 80 large project at 188-196 Foster Street (also part of the land bought from the Archdiocese of Boston) to build housing for BC's School of Theology and Ministry was submitted by the Jesuit society and approved in November 2008 by the BRA Board, although it was initially included in BC's IMP. The Zoning Commission changed the zoning at the property as part of its June 2009 IMP approval process. 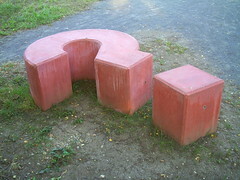 No monetary figure for damages is specified in the suit. Image of the scales of justice in Haarlem, The Netherlands by lant_70 provided through a Creative Commons license. UPDATE: The Boston Globe now has a story on it. 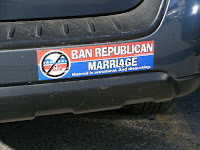 Here's a bumper stick that you'll probably only find in Massachusetts: "Ban Republican Marriage / Hatred is unnatural. And disgusting." Seen in Brighton the day after Martha Coakley, the Attorney General of Massachusetts, sued the federal government over the latter's Defense of Marriage Act definition of marriage as being between one man and one woman. 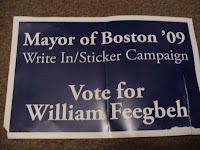 While Brighton resident William Feegbeh may not have been successful in getting on this fall's ballot for Mayor of Boston -- he gathered enough raw signatures, but not enough valid ones to pass the 1500 signature minimum -- he is now running a write-in (sticker) campaign instead. ...William Feegbeh [is] a 40-year-old who describes himself as a Northeastern political science graduate. He grew up in Brockton after coming over from Liberia in the 1970s when he was around seven years old. At least one commenter over at Universal Hub is not quite so generous in his description of Feegbeh.